Make 2017 the year that you Learn CPR ! Below is our Heartsaver CPR/AED course schedule. Most cardiac arrests happen in the home or your workplace – not in the hospital. Whether or not your co-worker or loved ones survive cardiac emergencies largely depends on how quickly someone begins CPR. Let’s say you need some type of training, like First Aid or CPR, or Healthcare Provider CPR – but the class you need isn’t the class offered? At least on Sat. July 12, we’ve got a solution for that. Yes, you can really learn life-saving skills before or after your BBQ dinner! Try it out, at Dickey’s BBQ Pit, Thomas Crossroads, on July 4, 2014, from 11 am – 2 pm. Whether or not you dine at Dickey’s – you get a free ice cream cone for learning something that might help a family member. 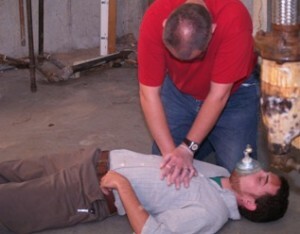 Experts believe chest-compressions only are easy enough to learn by most folks in 10 minutes or less. That’s one of the reasons that “Hands-Only CPR” has gotten so much support. That’s also why we try to have “Sidewalk CPR”, just to show folks how to do chest compressions.